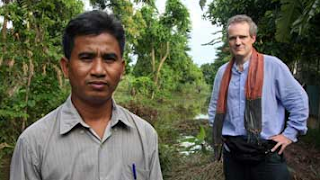 Thet Sambath has been looking for the truth for ten years. That’s how long it’s taken him to track down some of the men and women involved in Cambodia’s savage Khmer Rouge regime. His father, brother and mother were murdered during that reign of terror, but Sambath isn’t after revenge – he wants his countrymen to hear their stories. If anyone can persuade ageing party cadres and henchmen with blood on their hands to open up, it’s Sambath. A senior reporter on the Phnom Penh Post, he asks extraordinarily uncomfortable questions with charm, humility, smiling eyes and a gentle voice. A British filmmaker, Rob Lemkin, has captured Sambath’s mammoth quest and turned it into a film, Enemies of the People. It has been nominated for an Oscar. Every weekend Sambath kisses his young family goodbye and heads into the country, video recorder in hand, to dig up the unbearable past. His wife, wringing out washing, is non-plussed: “I wonder why he is so different from other people,” she smiles. “He’s always off in the forest.” She seems unaware that he has sacrificed ten years of his life to discover, for the first time in Cambodian history, what actually went on between 1975-79. She just misses her husband. Sambath started at the top. Nuon Chea (below) was Brother Number Two to Pol Pot – and is now an 84-year-old with bad teeth and a certain grace. 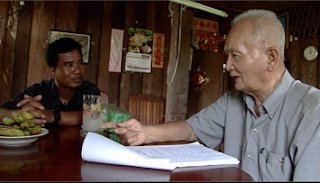 It took three years of regular interviews before Nuon Chea admitted knowledge of any killing, something Pol Pot never did. Between them they were responsible for killing hundreds, probably thousands, of Cambodians. They slit their throats and, when their hands started to ache, stabbed them in the neck and flung the bodies into ditches. Sambath, armed with a plastic knife, smilingly asks one of the men to show him how he did it, as casually as if he was asking for a demonstration on the best way to slice an onion. Later, they confess to eating human gall bladders. But they are remorseful, and eager to tell their story. One of the men has a look so haunted he appears possessed (pictured, below). 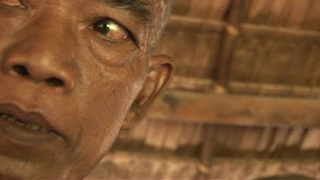 A Buddhist like most Cambodians, he isn’t expecting to come back as anything much in the next life. “I feel desolate,” he says. Meanwhile, Sambath has decided that, after ten years, he’s finally ready to tell Nuon Chea that his own family was butchered in the 70s. He hadn’t wanted to tell him before in case Nuon Chea thought he was out to avenge them. He does so softly, off camera, while we watch the man’s reaction. “What is your response to my family’s story?” asks Sambath, quietly. It’s unbearably moving. It is entirely to Sambath’s credit that you feel no hatred towards these men, only sorrow. Perhaps we see them through his forgiving, generous eyes. "These people have sacrificed a lot to tell the truth," he says. "In daring to confess, they have done good – perhaps the only good thing left." I went to Cambodia earlier this year. Its people were warm, friendly but, behind the smiles, sad. Perhaps with these stories the country can start to come to terms with his heartbreaking past. If it does, one extraordinary man can take a lot of credit.